The Mixer is one of FL Studio’s core components. It’s basically a virtual mixing console where the audio signals internally generated by VST instruments and samples in the Channel rack get routed to, and where we add Effects plugins like reverb and delay to each signal. Sidechaining, bussing, equalization, compression, distortion, mastering, and a bunch of other signal processing operations are all done here as well. In this tutorial, we’ll take a deep dive into the FL Studio Mixer and learn how to use it to mix like a pro. Let’s get started! It all starts with an audio signal that is either generated internally within FL Studio or generated externally and enters FL Studio through your audio interface. External signals are created by instruments like guitars or by your microphone. Signals in FL Studio are internally generated in the Channel rack by either VST plugins or by samples and audio files. 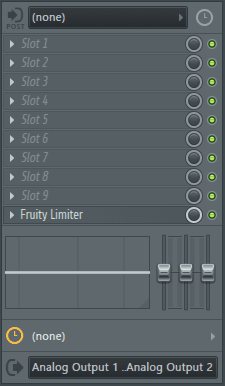 On the left side of each channel, there is a slot that tells FL Studio which Mixer track to send the signal to. — means the signal is sent directly to the Master track. At the top of the FX panel of each Mixer track, there is a drop down menu that allows you to bring in external signals from your audio interface. Below you can see the inputs from my M-Track Plus audio interface listed in the menu. The Mixer itself is split into several sections. First, we have the Mixer insert tracks that receive the signal from the Channel rack or your audio interface. FL Studio allows for up to 125 insert tracks, labeled 1-125. 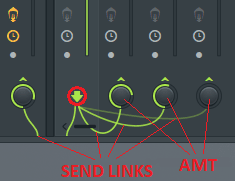 The bottom of each Mixer insert track shows a send link that indicates where the signal exiting that track is going. Each link has a knob that controls the amount of signal that is sent through the link from 0 to 100%. When the send amount knob is zero, the signal is sidechained. Click the small arrows at the bottom of each Mixer track to route and unroute the selected track to and from the target track. 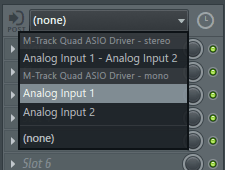 By default, each Mixer insert track is routed to the Master track. The Master track is where everything will ultimately end up, and where mastering effects and plugins will go. It’s the last stop before the signal get’s rendered into a digital audio file format like .mp3, .flac, or .wav. Next, let’s take a look at Mixer functionality and find out what all those buttons, knobs, sliders, and meters do. 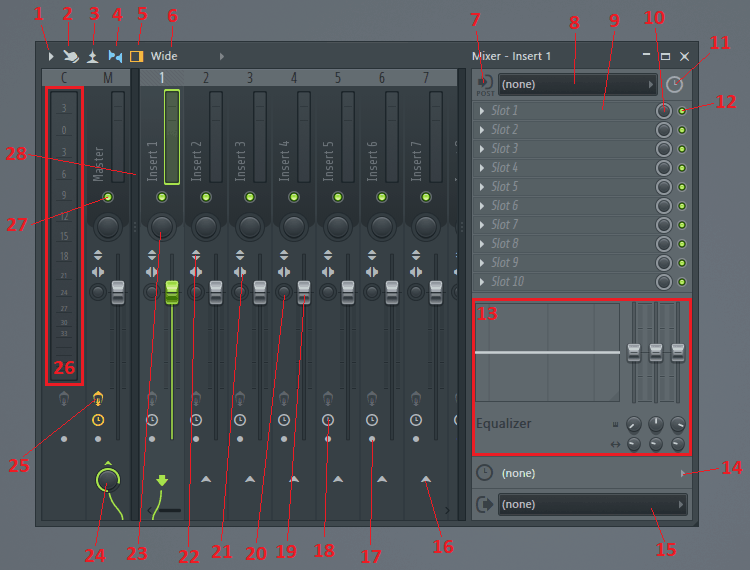 In the picture below, I’ve labeled each button and area of the Mixer with a number. As we go through the list, I’ll talk about some of the more important features and how to use them. From here, we can access recording, plugin delay compensation, and view settings. We can also load and save mixer track states. Mixer track states are like preset templates that we can load onto a Mixer track. Let’s say you want to make a mixer state for recording vocals or mastering. It could have Edison, EQ, compression, reverb or other effects in the signal chain (FX slots), all with different settings. Rather than manually adding these each time you start a new project, you could just save and load the Mixer state! Just select a Mixer track and choose a saved Mixer state in the FL Studio system folder. Toggle this on and off. Allows for multi-touch control of Mixer parameters. This is great for those of us using FL Studio on a tablet or similar device. Toggle this on and off. Rather than showing peak levels in each track’s meter, the Mixer will show a waveform. The shortcut is Alt+W. Toggle this on and off. It controls the visibility of the Mixer Track FX panel and slots on the right-hand side. Control the width and layout of your Mixer tracks. These settings could help you see things if you have a very large screen. Toggle this on and off. It allows you to choose whether or not recording on the selected Mixer track will be done with or without effects applied. Pre means record without effects, and Post means record with effects. Like we mentioned above, this is where you select an externally generated signal input for the selected FL Studio Mixer track. You must be using an ASIO device or driver for this to work. Usually, your audio interface manufacturer will supply an ASIO driver for your audio interface. This is where we load Effects plugins onto each Mixer track. Effects plugins are things like compressors, delay, reverb, distortion, equalizers, controllers, filters, limiters, and analyzers. The slot at the top of the list receives the input signal first, applies whatever effect is loaded there, and then feed the signal on to the next slot. Scroll your mouse wheel while hovering over slots to reorder them. You can also save and load Effects presets from the drop-down menu for each slot. This knob controls how much of the effect loaded in the adjacent slot is being applied to the signal. The knob can also be automated. Let’s say you have a delay effect loaded in a slot. You can automate the delay mix knob from 0 to 100% over a set period of time so that the delay becomes more and more prominent with time. When recording live, you will almost always encounter latency. Latency is the time it takes for an audio signal to travel from your mic or instrument, through your sound card, audio interface, or ADC, and into FL Studio. Usually latency is expressed in milliseconds (ms) or samples (smp). Each Mixer track has an audio input latency setting that applies a time shift equal to the latency to all audio that has been recorded on that track. For instance, lets say your input latency is 230 smp. This means that your recorded audio will be recorded and played back 230 smp later than events happening in FL Studio, even if your vocalist or instrumentalist timing was perfect. The input latency setting will remove the 230 smp delay from the recorded clip automatically and everything will be in sync. Toggle this button on or off to turn the adjacent effect slot on or off. This button can also be automated. Let’s say you want to turn a compressor or EQ on at a specific point in a track. You could do that by automating this mute button. 50% is the on/off threshold, so you can just use 0% for off an 100% for on. This box contains a built-in equalizer module for each track. 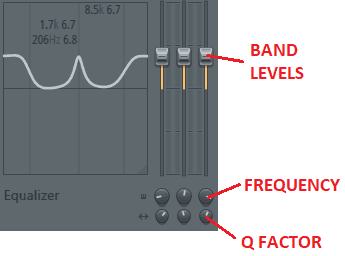 Here, we can modify EQ parameters for 3 separate bands. The left band behaves like a low shelf filter, the middle band behaves like a peaking or band-pass filter, and the right band behaves like a high shelf filter. The faders are the band level controls. The top row of knobs controls band frequency and the bottom row controls band width, also commonly called filter Q factor. 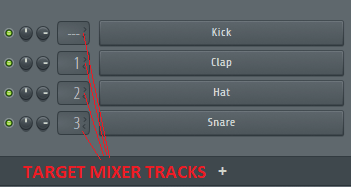 Click these to route the currently selected Mixer track there. Right-click for more routing option such as sidechaining. When a connection is made and the send switch is activated, the arrow becomes a knob that can be turned to alter the send level amount. 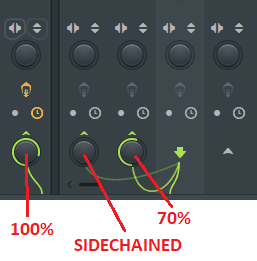 Right-click the arrow to sidechain one track to another. In FL Studio, there are a few ways to record audio. One way is by recording audio from any Mixer track directly into the Playlist. To do this, you first need to arm the track using this button. When the track is armed, the button will turn into a red circle. This is the time-offset delay for the selected track. When you record directly from a Mixer track into the Playlist, this is the amount of time delay FL Studio will apply to the audio clip after the time sweeper in the playlist passes it. For example, say you set track latency to 500 ms. This means that rather than play your clip immediately after the sweeper crosses the beginning of the clip, FL Studio will wait 1/2 of a second after that, and then play the clip. This is the overall volume of the track. The volume level is applied after the FX slot signal chain. It’s best to leave these mostly unchanged. Use the faders for fine tuning and instead change the volume knob in the Channel rack for course adjustments. You can also add a Fruity Balance to the first FX slot and modify it’s gain knob. This knob controls the stereo width of the signal exiting the associated Mixer track. Width can be described as the “centered-ness” of the sound. A wide, separated, or stereo mix will sound as if sounds are coming from the listener’s sides. A centered, merged, or mono mix will sound as if sounds are coming from directly in front of the listener. By default the knob is set at top dead center. Turning the knob left will widen the track, and turning the knob right will center the track, summing it’s L and R channels it to mono. This button will switch the stereo signals. Left becomes Right, and Right becomes Left. This can be used to correct mistakes when recording in stereo or syncing panning with visual effects. Phase is the position of a waveform in it’s cycle relative to another waveform. you can use the invert phase button to advance the waveform phase by 180°. This can be useful when correcting low-frequency phase cancellation issues. Let’s say your bassline and kick are 180° out of phase with each other. This will cause destructive inference and the two will cancel each other out. By inverting the phase of one or the other in the Mixer, they will then be in phase and work together for a cleaner and louder bass sound. This knob controls panning, or the apparent position of the sound, on the associated Mixer track. You can pan different drum elements to create a sense of space in your composition. Top dead center is means the track is panned center, while moving the knob left or right will pan the track in that direction. These knobs control the amount of the signal being sent from the selected Mixer track to the track that the knob appears on. When the knob is turned all the way to the left, the selected track is sidechained to the target track. This button toggles all FX loaded into the FX slots on or off for the selected Mixer track. It will only become available when there is at least one effect loaded into a slot in the track. This is pretty self explanatory. It gives you loudness in dBFS (decibels full scale) of all your tracks combined, otherwise known as the Master track. By default, the Master track has a Fruity Limiter set to 0 dB, meaning that the limiter will not allow the Master loudness meter to exceed 0 dB. Exceeding 0 dB on the Master track will cause your song to clip and distort when it gets rendered to .mp3 or .wav, so the limiter is there to stop that from happening. Toggle this on or off to mute all sound coming from FL Studio. 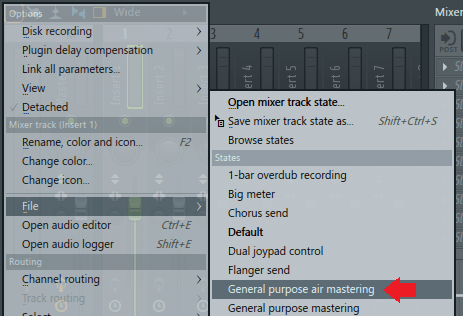 Click these 3 small dots to hide the Master meter and Master track in the Mixer. If you find that your Master information has disappeared, you probably accidentally clicked this and it’s hidden from view. Just click it again to unhide the Master. That’s a lot of information to take in at once, and some of this will be more useful to you than others depending on your production style and workflow. Let’s take a look at some common uses and tips for all of this information. Like we mentioned earlier, these should be used mostly for fine tuning the overall levels of their corresponding tracks. By automating the faders, you are restricting your abiliity to make small changes further down the road. On top of that, the faders are not programmed to handle automation. Instead, add a Fruity Balance to an FX slot and automate the volume knob. This knob, which we covered above under #20, is a lot of fun to automate. For instance, before a drop or transition, you could automate a snare riser or other tension-building progression to start out in mono and then increase the width up to the drop or transition point. This gives the listener the sensation of the sound coming towards them and then surrounding them. I used this technique with delay on a lead synth in my track called Dopaminergics at around the 3:30 mark. We can see exactly how it’s done and what it sounds like in the video below. There are several ways to do this. First and foremost is renaming your tracks after you’ve routed things to them. I’m guilty of not doing this sometimes. I’ll only be concerned with getting ideas on the table as fast as possible but later on in the mix things get very difficult for me to keep track of. It’s worth it to slow down a bit and take the extra 5 seconds to label your tracks. To rename your track, select it and press F2, right-click it and hit rename, or center mouse wheel click. Hit Enter to save the name. You can also organize your tracks by color coding them. For instance, your drum tracks could be blue, bass could be orange, lead synths could be green, etc. You can change the color in the same menu that you change the track name in. I also like to bunch similar tracks together. To move a track left or right, select it. While selected, hold down Alt and hit either left ← or right → arrow key to move the track over. We covered a lot of ground here! It’s plain to see now that FL Studio has an intuitive and user-friendly internal routing and mixing system. Like everything in life, mastering the FL Studio Mixer will take a lot of practice and patience. The best advice I can offer is to never give up, and never stop learning. If you liked this 100% free FL Studio tutorial, let me know what else you’d like me to cover in the comments, on the Synaptic Sound Facebook page, or YouTube channel!